We see very few photos of Chinese (People's Liberation Army Navy) ships, so a look at a Chinese naval musuem is a rare treat. This museum, operated by the Navy and located at a former naval base at Qingdao, features several very interesting ships, including former US and Soviet vessels. These photos were taken during a visit to Qingdao on 15 July 2000. In addition to the vessels shown below, this museum includes a submarine (reported to be a 'ROMEO' class numbered 229), an additional destroyer or frigate, a 'HUANGFENG' class missile boat numbered 3101 (a Chinese copy of the Soviet 'OSA I' class), various small craft, and numerous vehicles, tanks, aircraft, and other weapons. 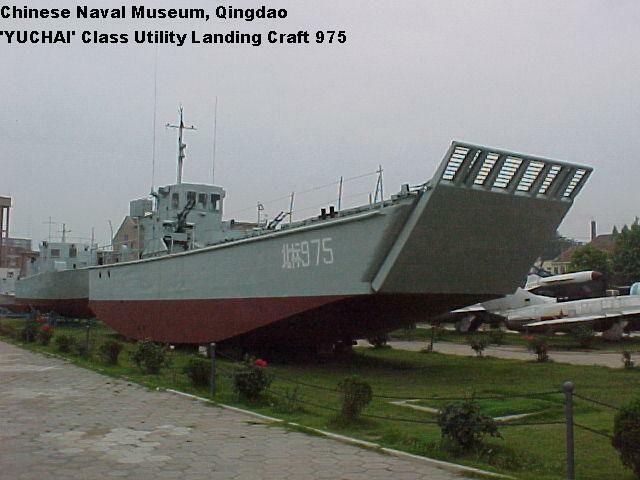 A 'YUCHAI' class utility landing craft, number 975. 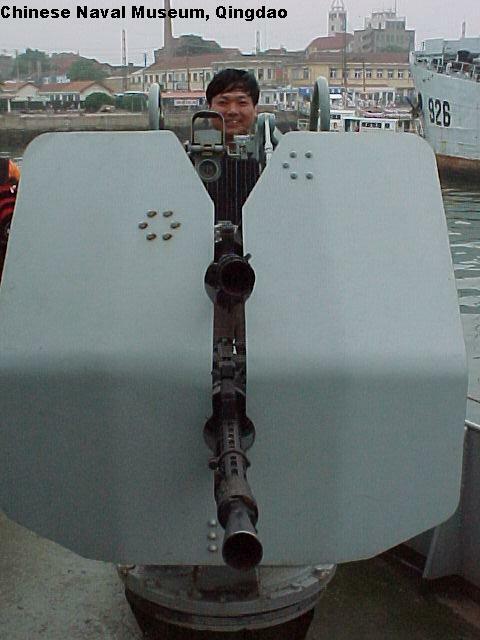 This class was built in large numbers starting in the 1960's; they are armed with two dual 14.5mm machine guns. 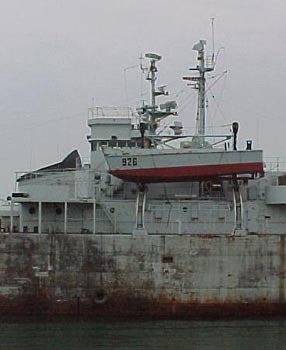 A tank landing ship, number 926. The origin of this vessel is obvious - it is clearly a US WWII-era LST. At least 30 US LSTs were transferred to China immediately after WWII, mostly via the State Department. Of these, 11 went to Taiwan and 16 to mainland China following the civil war. It has been nearly impossible to trace the history of these vessels following the war, but this ship has been positively identified as the former LST 1008 (see below for details of this identification). LST 1008 was built by Bethlehem Steel at their Quincy Fore River plant; she was laid down 16 February 1944, launched 23 March 1944, and commissioned 18 April 1944. She operated in the Far East and China area following WWII. 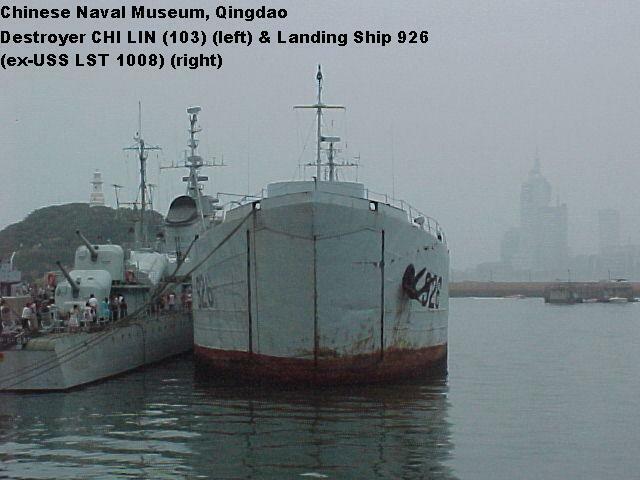 LST 1008 was decommissioned 4 May 1946 and transferred to the State Department on the same date, presumably for further transfer to China. She was stricken from the US Naval Vessels Register on 19 June 1946. 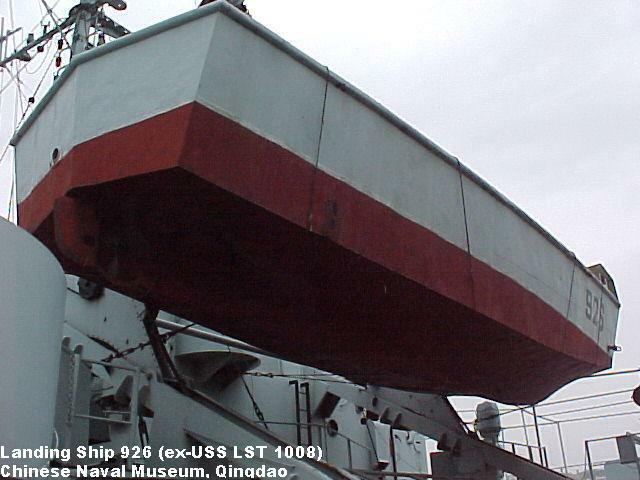 A closeup of the LST's bow and the two ships moored inboard. The ship whose bow is visible, furthest from the camera, is the frigate Kunming (506), a Chinese-built copy of the Soviet 'RIGA' class. The four Chinese 'RIGAs', built using components supplied by the Soviets, were launched in 1956-57. They enjoyed long careers, finally leaving service in 1990-1993. A end-on view of the LST and the destroyer moored inboard. The destroyer is another foreign ship, having started life as the Soviet Type 7 destroyer Retivy. Retivy was launched at Nikolayev in 1940 and transferred in China in July, 1955; she was one of four Type 7 ships transferred in 1954-55. 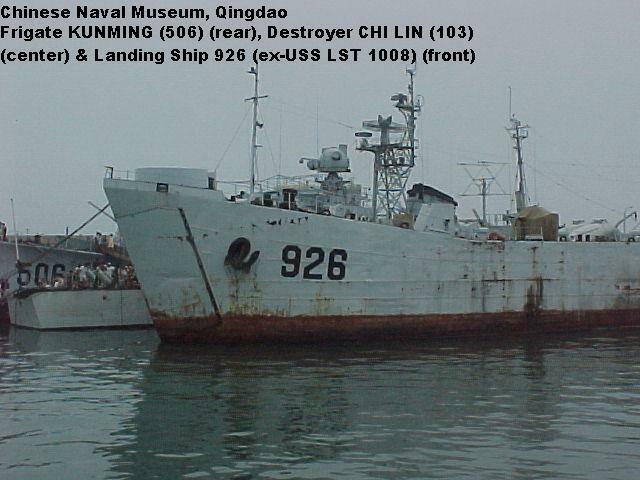 In Chinese service she was renamed Chi Lin (103). In the early 1970's the Chinese modernized these obsolete ships, installing 4 HY-2 SSMs in place of their torpedo tubes. All four remained in service until 1991-1992, a remarkably long career for vessels considered lightly constructed and structurally weak. All the Soviet units of this class had been discarded in the 1950's. A closeup of the LST's superstructure. Although the superstructure has been modestly expanded over the years, the general configuration is the same as in 1944. Two masts appear above her superstructure - but only the mast at right is on the LST; the other is on the destroyer moored behind the LST. 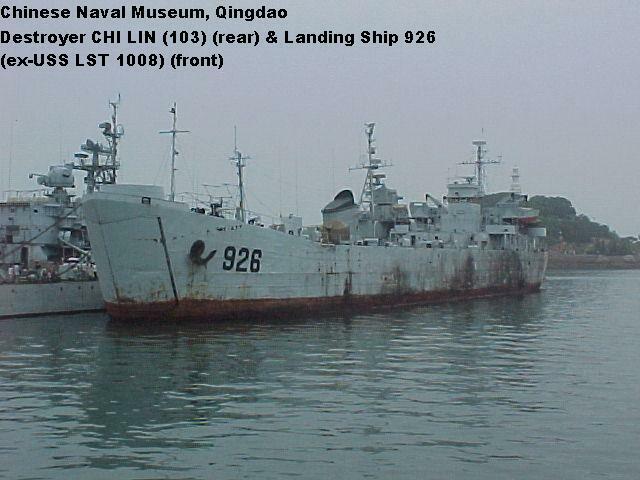 Although many of the LSTs in Chinese service were reportedly employed as repair ships, barracks ships, or other dockside uses, this LST appears to have retained her amphibious landing role to the end. 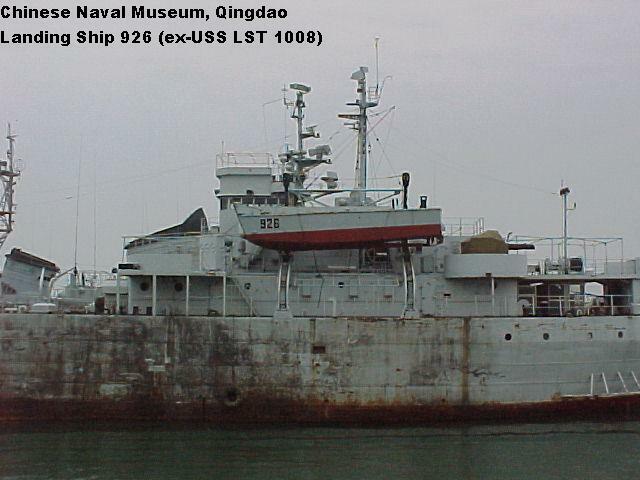 It is reported that the last ex-US LSTs in Chinese service were discarded by 1998; this ship was probably among the last in service. A closeup of one of the small landing craft carried in davits aboard the LST. Confirmation of the LST's original identity. It is standard practice for a vessel's painted-on name or number to be outlined in weld bead, as a means of semi-permanent identification. 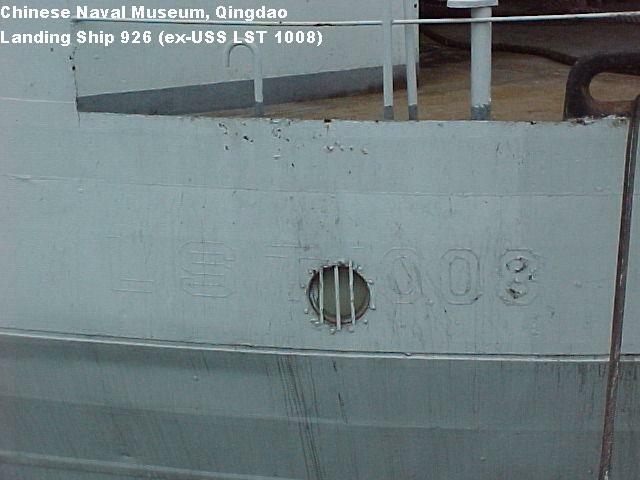 Here, nearly 60 years after construction, the outline of the ship's number can be clearly read. It is remarkable that, after over 50 years in Chinese service, no effort was made to grind off this identification - even when a porthole was cut through the "1". 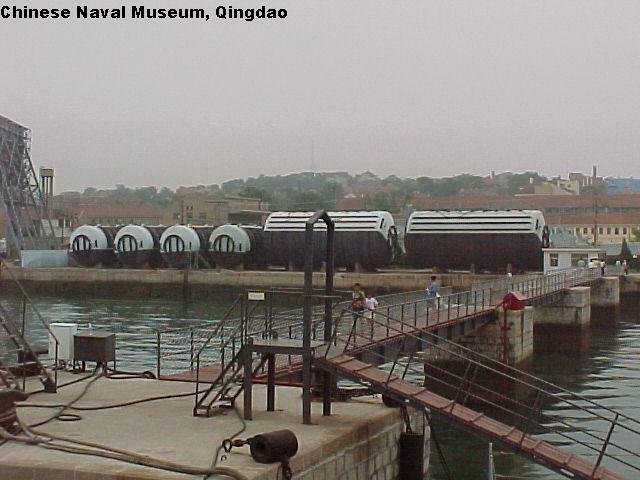 Six large cylinders, apparently salvage pontoons, stored along a seawall near the Qingdao museum. 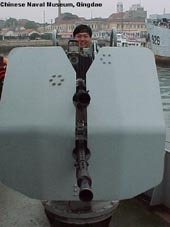 An antiaircraft gun aboard one of the ship at the Qingdao museum.